The first boxing card of 2019 to be held in the Mahoning Valley is all set in stone as Lights Out Management will host a night of amateur boxing in Austintown at Se7en Night Club on Saturday, March 9. Tickets for the event which start at $15 for general admission and $25 for VIP will be available at the door, which will open at 5:00 PM or by contacting Lights Out Management through their Facebook Page, https://www.facebook.com/Lightsoutmanagement1/. Tables of 8 will also be available for $300 and $400. First bell is slated for 6:00 PM. Lights Out Management had a successful 2018 which saw them showcase the best fighters from Ohio, Pennsylvania, Michigan, and Canada while raising $25,000 for local charities. 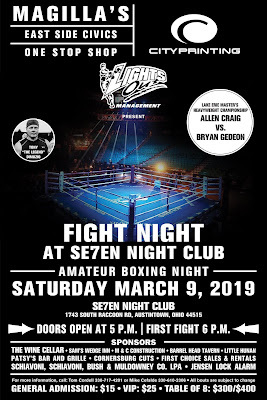 Stay tuned for more information on this card and other future cards by Lights Out Management as they have a solid 2019 lined up.